Turkey breeders have invested in selection methodologies to ensure the commercial cross is capable of delivering outstanding performance with good welfare under a variety of farming environments. As with all breeding improvements, these will accrue over time. Robustness can be described as the overall fitness and vitality of the bird. Birds with good robustness will express high liveability and welfare throughout their life across a range of production environments. Robustness is highly influenced by gut and metabolic health, skeletal development and immune system function. Breeders play an important role in improving robustness through incorporation of appropriate selection goals within the breeding programme. Production, health, fitness and welfare traits and the genetic correlations amongst them are considered simultaneously in the breeding programme thus ensuring a balanced strategy to improving the breed. Two examples of the approaches used to improve robustness within the Aviagen Turkeys breeding programme are outlined below. 1. Gut health. Water consumption is an indicator trait for gut functionality, water retention and the potential to affect litter moisture. Identifying birds with genetic potential for high water intake will help select for improved gut functionality as well as reduced wet litter. Individual water consumption is recorded using a transponder-based system, which records the amount, duration and location of each drinking session for each bird. The heritability of this trait is moderate to high (>0.3), allowing rapid progress by selecting against birds causing excessive litter moisture whilst maintaining birds with adequate water consumption to meet their needs across a range of environments. Genetic trends in water intake of pedigree lines shows significant progress will be delivered in the commercial cross and will, as a consequence, improve litter dryness and foot pad dermatitis levels in the field. 2. Multi-environment selection. Breeders select within environments, which are relevant to commercial field conditions in order to minimise genotype by environment interaction. Natural gut and immune challenge and management factors such as commercial stocking densities, nutrition, litter management, lighting are incorporated into the pedigree environment. Within the Aviagen Turkeys programme there is no coccidiostat usage and no routine antibiotic administration to allow an element of gut and health challenge. Breeders are at the start of the industry supply chain so they need to operate under higher biosecurity conditions to ensure day-old poults are free from specific pathogens such as Salmonella spp and Mycoplasma spp. Therefore within the pedigree programme it is difficult to directly select for birds based on their immune competency. 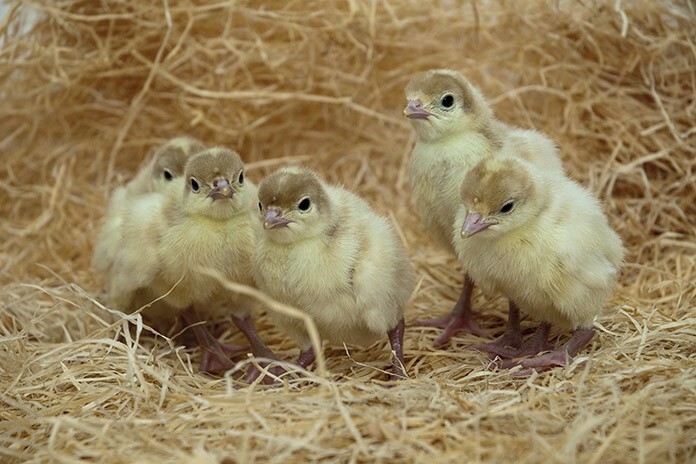 To overcome these constraints, Aviagen Turkeys has invested in a fully separated farming system, where siblings of the pedigree birds are grown and measured in a multi-age, commercial environment where gut health, digestion, liveability, growth and uniformity can be assessed in the presence of a greater immune challenge which has developed naturally as a result of the multi-age nature of the site. Information on these siblings is then used in the selection process for the pedigree birds. Re-ranking of families between these two environments and identification of individuals with the potential to perform well in both conditions confirms the contribution of this process to improving breed robustness. This gives the breeder the opportunity to improve adaptability of their breeds to the range of management practices they may encounter in the field without the need to resort to antibiotic use. Substantial investment has been made by Aviagen Turkeys to broaden breeding goals and enable inclusion of robustness and welfare related traits within breeding decisions. Estimates of genetic progress and field evidence indicate these improvements are now benefitting commercial turkey production. Alongside production related efforts, genetic improvements will further assist the turkey industry to address the pressures for reduction in antibiotic use and improve turkey welfare whilst maintaining good biological and economic performance. Previous articleFeed borne mycotoxins: the threat to poultry?